I’m recently finding myself drawn to the world of aromatic scents. Previously I’ve always found them to be too strong and overpowering. But the perfume houses have refined their interpretations of Orientals notes over the years and as my familiarity with Oriental fragrances grows, I’m being won over. I cannot help but love Tom Ford for his signature perfume design. 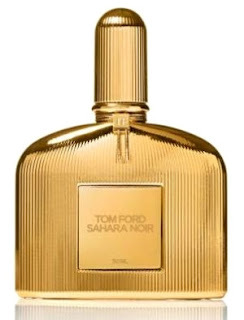 And although Sahara Noir is encapsulated in the same signature fragrance bottle as his other scents, he adds a special touch by dipping the entire bottle in a pool of gold and the golden bow accent on the neck of the bottle lends the right delicateness to the otherwise bold design. The opening notes of Sahara Noir reminds me of a dimly meditation room, located somewhere in tranquil surrounds - the air thick in burning incense, evoking a deep warmth of frankincense and rich citrus notes. I’m curious as I approach this alluring and mysterious scent, for it exudes a strong presence. I gain more confidence as I become captured by its notes, I can feel notes of jasmine and Levantine Cypress peek through. As I discover the scent more, I uncover powdery vanilla and a light sweetness of amber notes. Within the hour it settles down to a balmy, and mellow incarnation – woody Agarwood and Cedar complemented by cinnamon and rose absolute now permeates through as it gentles envelops the skin for the rest of the day. Mature and refined, Sahara Noir hits all the right notes from the warm Floriental family. I can definitely bask myself in this for many hours without feeling like I'm overwhelmed by its initial intensity. Potent and exotic, a little goes a long way so spray with light fingers and possibly from a further distance than you normally would with other scents until you master this exotic scent. Tom Ford Sahara Noir EDP 50ml - RRP A$230 at David Jones city stores only.